Over and over, people are told that test scores are lower. Commenters quickly started bruiting this claim in response to the Lyons piece. In most cases, these commenters didn’t seem to have understood the basic things Lyons had said. They didn’t dispute his factual statements. They simply skipped right past them. Our “career liberal” leaders are worse than useless. Our “educational experts” are anything but. 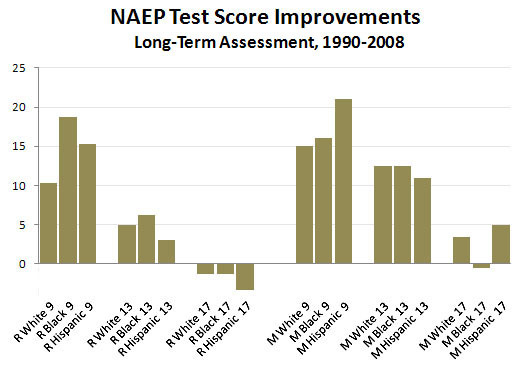 Everyone praises the NAEP test scores—but no one reports what those test scores show! I’d like to see a bit less panic over our failing schools too. Still, I think the picture is a little less clear than Bob makes it out to be. He points out correctly that looking at raw averages is sometimes misleading: Blacks and Hispanics have always scored lower than whites on standardized tests, and as their population increases that lowers the overall average even if all three groups are actually doing better. To see what’s really happening, you have to look at test scores for all three groups separately. The usual rule of thumb on the NAEP test is that ten points equals one grade level. So what lesson can we draw from this data? Answer: it’s mixed. Nine-year-olds in all three groups have indeed made huge advances in both reading and math, ranging from 10 to 20 points. But things start to slide when you move up to middle school. Improvement among 13-year-olds in math is more modest than among 9-year-olds, though still quite respectable, but reading scores are up only a few points. And when you get to high school things really go to hell. Reading scores for 17-year-olds have gone down and math scores have improved only a bit. This is all just raw data. You can decide for yourself whether standardized test scores are a good measure of student achievement. You can also decide for yourself which age groups matter the most. My own take is twofold: (1) Our students aren’t doing any worse than they did in the past. Panic isn’t really justified. (2) Improvements in reading and math scores that wash out by the end of high school aren’t that impressive. Until we see substantial improvements among 17-year-olds, I don’t think you can say our students are doing much better either. Are there reasonable arguments against this position? Sure. Maybe the real issue is how we compare internationally. Unfortunately, that data doesn’t go back very far and can be tricky to interpret. I’ve seen significantly different results on different tests. What’s more, I’d argue that at an international level, production of advanced degrees is a lot more important than modest differences in primary and secondary education. It’s also true that relying on data for 17-year-olds can be misleading thanks to changes in dropout rates over time. However, the trends for just the top-scoring students are about the same as the overall averages, and that’s not affected much by dropout rates. So I suspect this is a minor issue. I think ed reformers would also argue that most of the reforms of the past 20 years have been focused on the primary grades, so it’s not fair to judge those reforms by looking at stagnant 17-year-old scores. We need to see reforms widely adopted in high schools before we can do that. I guess I buy this to an extent, but it’s an argument that’s getting a little stale. At some point we have to fish or cut bait. Until we see improvements in the final product, so to speak, improvements in the intermediate steps don’t really mean very much. UPDATE: Wait a second! Several commenters pointed out that it’s cohort effects that we really want to look at. High school kids in 2008 have spent only a few years in the post-NCLB reform environment, so it’s hardly surprising that they don’t show big improvements. But how about kids who have spent their entire lives in that environment? Excellent question. To fully answer it we’ll have to wait for the 2015 crop of high school students to be tested, and even to partially answer it we’ll have to look at a different dataset. I do that here. Nickel summary: there are some caveats, but the overall picture is more promising than the one I presented here. There are indeed reasons to think that our schools are getting better and our kids are learning more.